Check out the new Fight Dentist Mexican Flag Mouthguard! Represent the ferocious denizens of Mexico with the Fight Dentist Mexican Flag Mouthguard. Its constructed with PolyShok technology, which is safer for atheletes and can absorb 150% more impact than ordinary EVA Mouthguards. This custom mexican flag mouthguard is made with the same materials as other Fight Dentist custom fitted mouthguards, but only come at a fraction of the price. 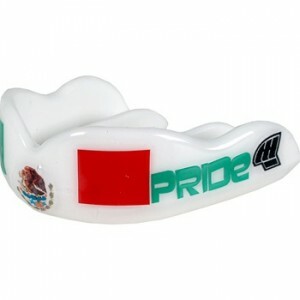 The Fight Dentist Mexican Flag Mouthguard is available at MMAWarehouse for $29.99.